There is a need for general theoretical principles describing/explaining effective design -- those which demonstrate "unity" and enhance comprehension and usability. Theories of cohesion from linguistics and of comprehension in psychology are likely sources of such general principles. Unfortunately, linguistic approaches to discourse unity have focused exclusively on semantic elements such as synonymy or anaphora, and have ignored other linguistic elements such as syntactic parallelism and phonological alliteration. They have also overlooked the non-linguistic elements -- visual factors such as typography or color, and auditory components such as pitch or duration. In addition, linguistic approaches have met with criticism because they have failed to explain the relationship between semantic cohesive elements and coherence. On the other hand, psychological approaches to discourse comprehension have considered the impact of a wider range of discourse elements -- typographical cuing of key terms to enhance comprehension -- but have failed to provide general theoretical explanations for such observations. 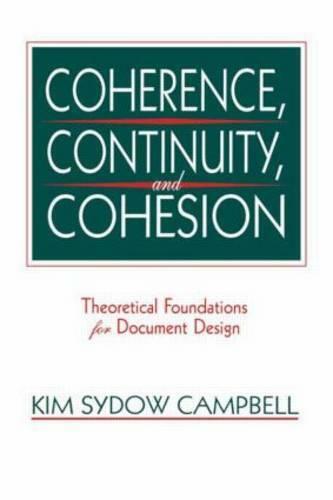 This volume uses Gestalt theory to provide general principles for predicting one aspect of coherence -- that of continuity -- across the entire range of discourse elements, and also to outline the relationship between cohesion and coherence. The theoretical core of this book argues that the cognitive principles that explain why humans "sense" unity in a succession of sounds (a whole musical piece) or in a configuration of visual shapes (a complete object) are the basis of principles which explain why we "sense" unity in oral, written, and electronically produced documents.